Simon’s Cat, the animated feline YouTube series designed by Simon Tofield, has inspired an animated advertising campaign for Fonterra’s Calciyum drinks in New Zealand. The campaign, designed by members of the Simon’s Cat team at Tandem Films, is designed to show that parents can outsmart their cute kids with Calciyum, the drink that is full of yum and contains the same amound of calcium as a glass of milk. 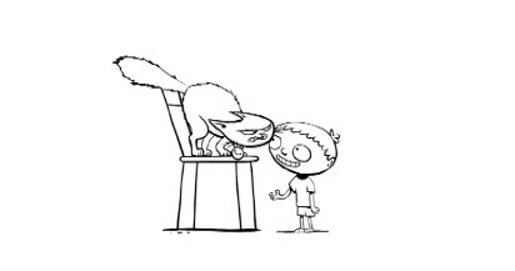 An animated cat sits on a chair while a cute kids annoys it over and over again. But it appears as though the cute kid is not smart, judging from the response to the cat’s vicious attempts at deterrence. The Simon’s Cat ad was developed at Colenso BBDO, Auckland, by executive creative director Nick Worthington, creative director/copywriter Karl Fleet, art director Emmanuel Bougneres, copywriter Edwin Hughan, agency producer Jen Storey, account managers David Bowles, Antonia Baker and Angela Vance. Animation was directed by Daniel Greaves at Tandem Films with producer Jo Evans and illustrator Helene Firren. Audio design was by Shrooty.